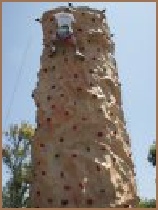 Upward Mobility can provide a mobile rock climbing wall for your event. Our wall is 25 feet high and can accommodate 5 climbers at a time on its realistic rock surface. If safety is a concern, our wall is complete with a fully hydraulic auto-belay system for each of the 5 climbing routes. 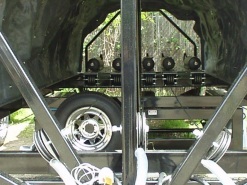 After the climber reaches the top of the wall, they simply lean back and let the system lower them safely and comfortably to the ground. Coupled with state-of-the-art speed harnesses that are safer and faster to put on than an ordinary climbing harness, the only thing you will have to worry about is getting yourself to the top. Since we have 5 routes to choose from ranging from easy to difficult, our wall provides challenging fun for beginning scramblers and experienced climbers of all ages. Young or old, tall or short, boy or girl, virtually anyone is capable of giving our wall a try. 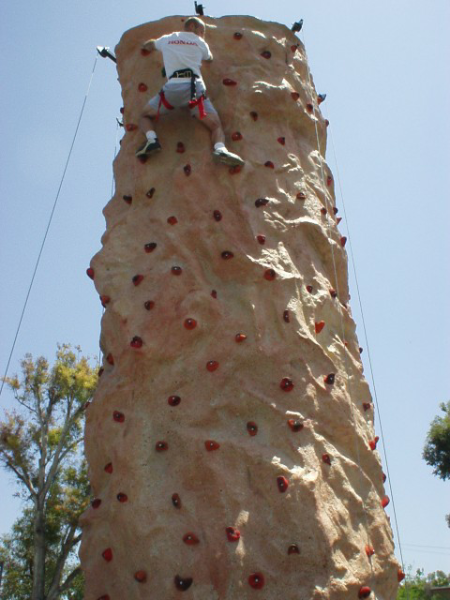 Our climbing wall is the perfect complement to your event, whether it's a school carnival, birthday party, fair, scout function, corporate event, whatever. Everyone gets satisfaction from hearing the buzzer they triggered after clawing their way to the top of our 25 foot peak. We can be at your next event. Give us a call.